2012. 160x200 pixels interlace - c64 koala. 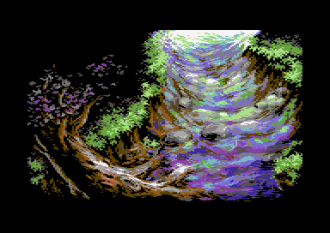 Entry for the Datastorm 2012 c64 graphics compo, placed 1:st (release date 2012-02-11). The background is just a mess. I couldn't come up with a decent idea on what to put there, so the ordinary post-apocalyptic thing seemed ok with her looks. Can you find my hidden pwl tag? Some people seem to think my dithering technique is a sign of convert/scan. It is not, I wanted to use a rough but repeating pattern to even out the colours in the face, creating a contrast between the "soft" face and rough surroundings. You could compare the stochastic printing raster with a amplitude modulation raster, where the AM pattern provides a repeating pattern for the eye which is perceived as "better". Yes, but the hairs is awesome! btw "One Quarter" has another version of that pic.